A day of sunshine and showers, which accurately reflects the mood of the team today. Lots of interesting work remains to be done, although most of it involves planning, recording and photographing elements of the site which have become as familiar as your own front door. But with just a few days to go, and the last tours and blog taking place on Tuesday (come along while you can, folks) there is a tinge of sadness at the end of six momentous weeks. Today, we said goodbye to Scott, from Willamette University, and his two boys, not to mention his 50,000 dollars-worth of portable XRF machinery. We had rather hoped that he might have left it behind for us to play with but, as he will certainly be back next year, we understand he plans to leave behind a box of clothing, rather than cart it across the Atlantic and all the way to Oregon. Hopefully, this might include his exceedingly hi-visibility orange jacket, a garment of such startlingly virulent colour that it is certainly visible from space. The archaeology department snowman might have a distinctly orange hue this winter. We’ll send you a photograph, Scott. Back to the work of the day. Ingrid, while excavating her metre-square section of bone-laden passageway, discovered that even this small section contained the bones of tens of individual cattle. This certainly vindicates Nick’s belief that the passageway held the remains of hundreds of beasts and makes this deposition all the more extraordinary. This deposit is clearly not associated with the actual use of Structure Ten but was part of the decommissioning of the building after it had lost its roof and been infilled with midden and rubble. The very unusual nature of this bone horizon, that is only present in the uppermost fill of the paved pathway, and its positioning around Structure Ten, is reflected in the special deposition of bone around other Neolithic buildings. The cow skulls with intertwined horns that form the wall core of one of the structures recently excavated at the Links of Noltland is an obvious comparable use of animal bones. 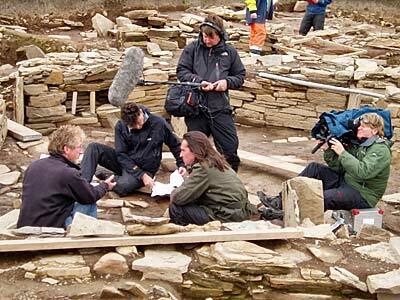 The BBC film crew returned, with Neil Oliver, for some more filming. The special programme which they plan on the Ness site should be shown in the winter, possibly just before, or maybe even during, the Christmas holidays. Look out for that. It has been two years in the making and should be well worth seeing. 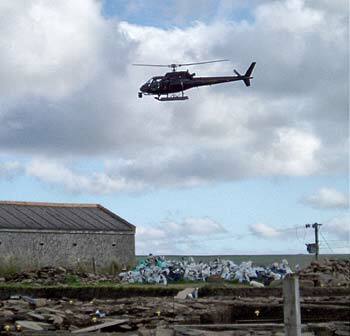 The team has hired a helicopter to take aerial shots of the site tonight, and they will then travel to Hoy to have a look for the source of haematite – the iron ore which is believed to have been used in the production of the red pigment for the Neolithic paint which is so prevalent on site. A small lump of haematite was found today, together with a beautiful flint tool from Structure Eleven. Significantly, while examining pottery from Structure Twelve today, Roy found another two pieces of the coloured Grooved Ware with applied decoration. This makes three sherds, in total, with coloured strips of decoration and it is yet another confirmation that we have been wrong to assume in the past that the Neolithic was a monochrome place. Certainly on the Ness they liked their bright colours, on walls and stones and now, apparently, on their pottery as well. 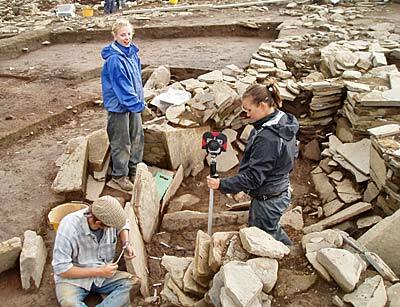 Kristina Fenske: I am with the Willamette University Crew on the Ness of Brodgar 2011 excavation. I am currently a fifth year student at University of California, Los Angeles, studying costume design and archaeology. Eventually, I plan to combine the two and continue my studies in textile archaeology. I came across the NOB excavation on the Archaeological Institute of America website and it sparked an interest immediately. I already had a strong curiosity to learn about the history of the Scottish people and wanted to join a field school that would, additionally, help guide my choices in future studies. 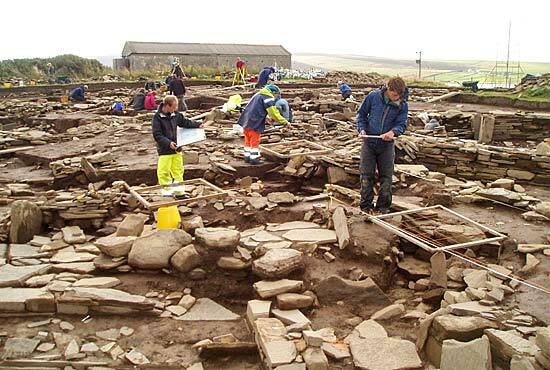 Coming to Orkney, and working on the site, has been an experience of a lifetime. When I boarded the tiny, thirty-seat plane from mainland Scotland to Orkney, I began to realise how different this place was going to be. After being on the excavation for over four weeks, each day has been a new experience full of surprises. Original artefacts are constantly being unearthed on site. I feel extremely fortunate to witness these finds that have been used over thousands of years ago. I’ve spent the majority of my time in the midden section, where a mass of dirt contains numerous amounts of pottery, small stone tools, pecked stone and flint. Recently, I have been moved to Structure Twelve and situated in the annex section of the building. This section of the structure is a Mecca for various pieces of the most beautiful pottery and stone tools. Anywhere on site is a true learning experience. Over the time I have worked here, I can see an ancient world slowly coming back to life. 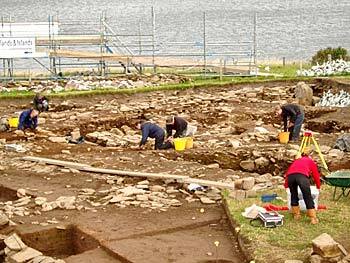 There is a job almost for every type of person in archaeology, from the arts to the sciences; this site covers such a rich cultural history, its hard not to not be mesmerised by the Ness of Brodgar’s past, present, and future. I have had several conversations with “returnees” on the site – people who have been coming back year after year. They’ve told me that their experiences at the dig compare to nothing else they’ve experienced on other excavations. The individuals this site attracts are some of the friendliest, whole-hearted people I have ever met. The Ness of Brodgar has been an incredible experience on the Orkney Islands. I have been lucky to have amazing supervisors, who have been influential teachers and motivators and I have learned so much while being here that could never be interpreted in any text book or classroom lecture. 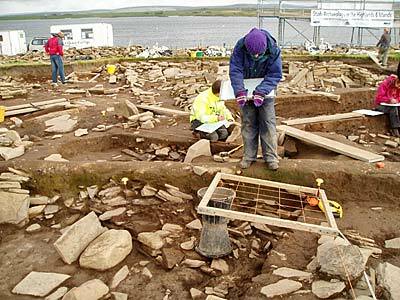 The Ness of Brodgar is definitely a place worth returning to. Emily Willis, Sam Dunning and Rebecca Neilson: Hello! We’re Becky, Emily and Sam from Cardiff University, and we are about to start our second year of studying BA Archaeology. This is the first excavation any of us have been on and it’s been a great experience. We are on the last week of the dig now, having been here since the beginning of August, and we have spent the majority of our time in the central midden area of Structure Eight. Becky: Like Emily and Sam, I have spent the vast majority of my time here digging in the central midden area of Structure Eight. At the beginning, it was grueling and I often felt deep resentment for the midden, but, over time, as I’ve seen it transform, I have grown to feel (almost!) fond of it. We have taken the soil down quite far in the three-and-a-bit weeks we’ve been here and we are now on a layer of rubble and technically out of the midden! It was a great sense of achievement to get it down to that layer and to see it all clean and ready to be photographed. Sadly I have found nothing of huge importance, only pottery, a couple of pieces of flint and a great deal of rubble! We have finished digging our section now (just drawing and recording left) and I feel almost sad that we do not get to take it down any further but I am proud of what we have achieved and it has been a wonderful experience. I have had a great time at the Ness of Brodgar and despite the pains getting here, and the sometimes freezing weather, I am glad I came. Nick and his team of supervisors have been excellent. They are very good (and often very patient) teachers. I hope very much to return another year! Emily and Sam: Just a quick word, as Structure Ten needs cleaning – even though you could argue the rocks aren’t going anywhere, the camera team is on the move! Although we have escaped for today, most of our time has been spent in the central midden area, with some days proving more eventful than others. Both of us have been very lucky with our finds, which include some very nice, worked stone tools, pieces of flint and the complete base of a pot that came out in one piece. Although these aren’t the most spectacular finds that have been unearthed at the Ness, we’re still pretty proud! Since being here, we’ve been involved in many aspects of excavation, from using equipment worth thousands of pounds (which we were terrified of dropping or breaking) to filling out endless context and recording sheets. Although some jobs are definitely more interesting than others, it has been an invaluable experience, that will definitely help as we progress in our degree. It’s almost time to leave the dig and head for home, on some very long and bumpy coach rides. But the time spent here, and the people we’ve met, have been fantastic. We hope to come back next year to see our supervisor’s eyes light up as he continues in the noble art of mattocking.